This 14-year-old boy presented with acute knee pain and swelling following a basketball injury. The lateral radiograph (A) shows a joint effusion with an intra-articular ossific fragment. 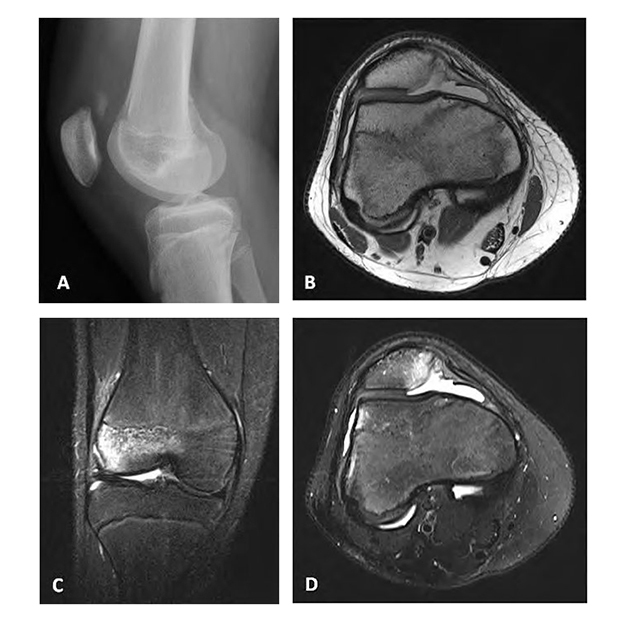 Axial proton density (B) and coronal (C) and axial (D) fat-saturated T2-weighted MR images show lateral femoral condyle and medial patellar contusions, with a large osteochondral defect at the medial patellar facet. Lateral patellar dislocation is most often seen in younger patients, frequently as a sports-related injury. Dislocation is usually transient and is often not clinically suspected. Morphologic features which predispose to dislocation include patella alta and dysplasia of the trochlear groove, the latter of which was present in this patient. As dislocations are usually transient, radiographs may be completely normal or only show a joint effusion. MR imaging typically reveals a characteristic pattern of osseous contusions at the lateral femoral condyle and medial patella, with chondral injury at the medial patellar facet. Close evaluation of the medial patellar stabilizers is warranted, particularly the medial patellofemoral ligament. Management of isolated dislocation is often conservative. Surgical intervention is undertaken in the setting of osteochondral injury or significant injury to the medial stabilizers. Jaffray P. At the Viewbox: Acute Lateral Patellar Dislocation. J Am Osteopath Coll Radiol. 2013;2(4):33. Dr. Jaffray is with the Department of Radiology, University of Maryland Medical Center, Baltimore, MD.